The power of lighting in interior design should never be underestimated and in her new book Design Director Sally Storey offers clever ideas and expert advice on all aspects of lighting for the home and garden to maximise its potential. What lighting can do for your home – The effects of lighting, demonstrating the key principles of lighting design. Topics are helpfully illustrated with feature spreads and checklists showing how specific room schemes have been created. Light as a decorative tool – Individual lighting solutions are explained in detail, with examples of specific effects (for example backlighting a stairwell, concealed lighting slots in a dining room to name but a few). Lighting at work: room by room – the key considerations when planning lighting: how to link and divide spaces, how to enhance a small space with lighting, provide focal points etc. 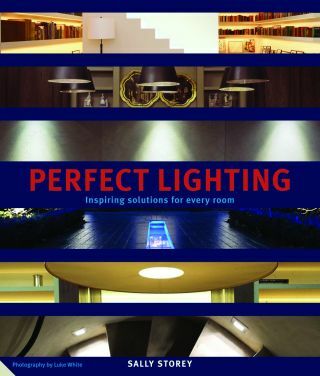 Real locations are used to show examples of different lighting techniques.The book as a whole excites the reader on how lighting design can transform the home and the wide range of effects that can be achieved, with creative and inspiring illustrations from across the UK and France. ‘Perfect Lighting’ reveals professional techniques to make interior spaces more flexible and demonstrates how to create lighting schemes that are both atmospheric and mood-enhancing whilst also working on a practical level. To buy your copy, visit the showroom or call 020 7371 9000.